Ride-hailing giant Uber and aspiring “Uber of home services” Handy, along with other tech-companies-turned-service-providers, have been conspiring with powerful corporate allies and lobbyists on a far-reaching, multi-million-dollar influence campaign to rewrite worker classification standards for their own benefit—and to workers’ detriment. 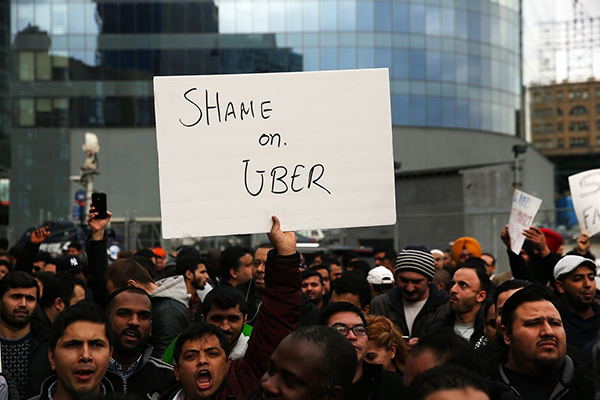 Their goal: to pass policies that lock so-called “gig” workers who find jobs via online platforms into independent contractor status, stripping them of the basic labor rights and protections afforded to employees and allowing the companies to evade payroll taxes and worker lawsuits. This report sketches the policy campaign, the cast of characters involved, when and where they have mounted efforts, what might be driving them, and the tactics they are using to advance their cause. It concludes with some examples of successful resistance to these efforts, from which lessons can be drawn for the fights to come. The report was picked up in the New York Times, click here to read their coverage on the topic. President Donald Trump has signed the United States–Mexico–Canada Agreement, or USMCA. It’s supposed to replace the old North American Free Trade Agreement, which he called “the worst trade deal” this country has ever seen. But guess what? As far as working families are concerned, the USMCA is just more of the same. We can do better: Tell Congress to refuse to vote on the new NAFTA until it is fixed. The “new” USMCA fails to raise wages. It also locks in high U.S. medicine prices. Big Pharma rigged the rules: NAFTA 2.0 guarantees extended monopoly rights for pharmaceutical corporations to block generic competition. This would tie the hands of Congress to change the policies that lead to high drug prices, both now and in the future. It’s not just about us—a better NAFTA could protect working people in the United States, Canada and Mexico by guaranteeing decent wages, reining in high drug prices and ensuring the freedom to join a union, and by standing up to corporate greed. Tell Congress: Don’t vote on the new NAFTA until it is fixed! This week, The entire labor movement is calling on Congress to pass legislation to raise the federal minimum wage to $15 per hour. The federal minimum wage has been fixed at $7.25 for a decade. 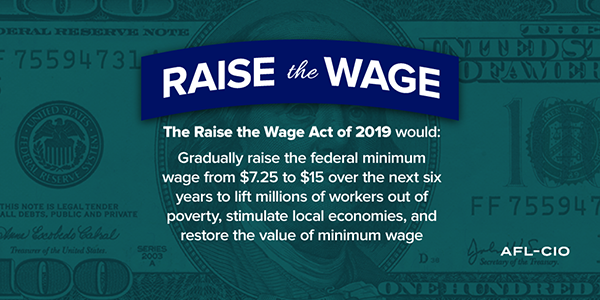 The Raise the Wage Act of 2019 would increase the minimum wage to $15 per hour by 2024. The bill would also automatically increase the minimum wage so that it keeps pace with the average worker’s pay and gradually raise the tipped minimum wage, which has been stuck at $2.13 per hour since 1991—nearly 30 years. 38.6 million adults over 18. The parents of 14.4 million children. Take action NOW. Call your representative and tell them to #RaisetheWage.